With the help of local businesses such as Morningstar Electric, Brandon Electric, Flags Unlimited and Tommy Green- Landscaping, Brandon South Rotary was able to dedicate a flagpole beautification project in September at Rotary Camp Florida in Brandon. When the members of Brandon South Rotary were looking for a community service project that had a local impact, they did not have to look beyond Rotary’s Camp Florida. 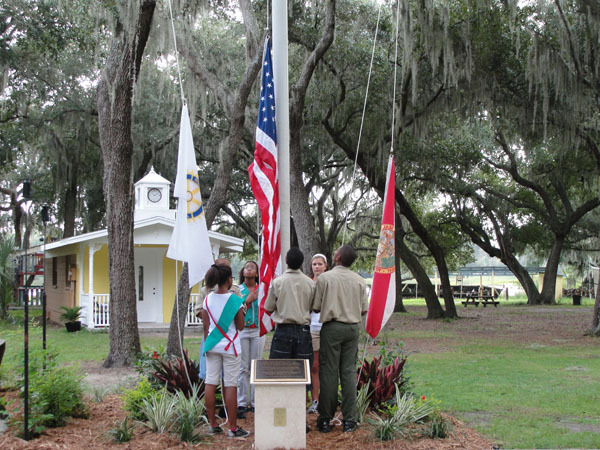 The club decided to adopt care and maintenance of the flagpole at the camp. Now, this is no ordinary flagpole. From February of 1986 until it was donated in May of 2005, the flagpole was located at the Naval Reserve Center in Tampa. Unfortunately, the pole and the flags had fallen into a state of disrepair. With Rotary spirit and help from several local businesses, three beautiful flags now proudly and continuously fly from a beautiful flagpole surrounded by lovely landscape. Two of the three flags (U.S., State of Florida) were donated by John Lynch, of Flags Unlimited. Brandon South Rotarian, Pat Hill, courageously boarded a bucket truck donated by Brandon Electric, and scrubbed the pole clean. Tommie Smith, of Seffner, beautifully landscaped the area around the flagpole. The landscaping will be maintained thanks to Brandon South Rotary. Thanks to Jim Harmon, executive director of the camp, a plaque commemorating the flagpole has now been mounted on the monument so that all visitors will know its history. Rotary Camp Florida is an 18-acre campground for children with special needs, located at 1915 Camp Florida Rd. in Brandon. For more information on the camp, please visit www.rotaryscampflorida.org. Brandon South Rotary meets every Wednesday at 12 Noon at Buckhorn Springs Golf and Country Club, located at 2721 S. Miller Rd. in Valrico. Visitors are welcome. For more information on the club, please visit www.brandonsouthrotary.org.